I had a phone conversation with the Blue Ridge Home Fasion salesman today. She told me that Costco had ordered more of the Down Throws. It is un clear if they will be back in the stores before winter ends. There are other stores that have ordered them. When I asked which stores she only said that they are sports and camping stores. She also said that they will be at the same price point. They are very excited at the response to this item. She hinted at similar throw with more down. I feel good and warm all over that some more DIY stuff will be coming soon. Good news. Hope to find them locally. I got an email from Blue Ridge Home Fasions today. They have shipped more of the Down Throws. Theysaid they should be back in the Costco stores very soon. Thinking of making one of Sarges top quilts with one. If I can find a friend that is a member at Costco. And thanks for taking the lead on this Ken. 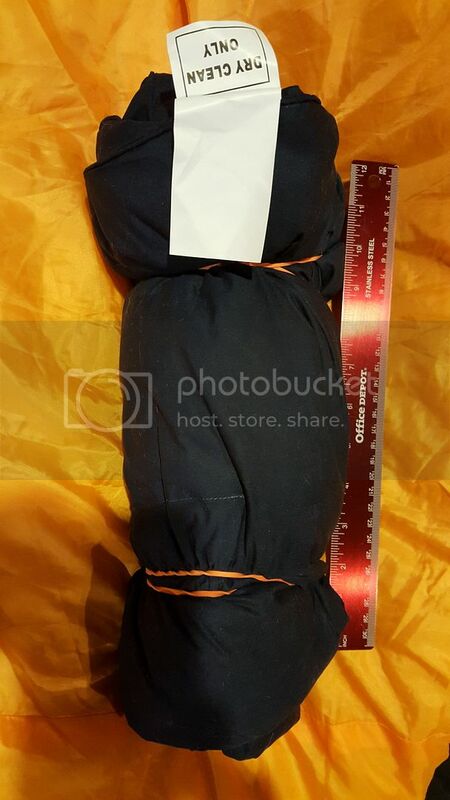 Sierra Trading Post has a similar down throw blanket that is NOT the same thing as sold by Costco but may work for some projects such as Torso length Under Quilt or a very short Top Quilt OK for a short adult or child perhaps unless you add 2 together. 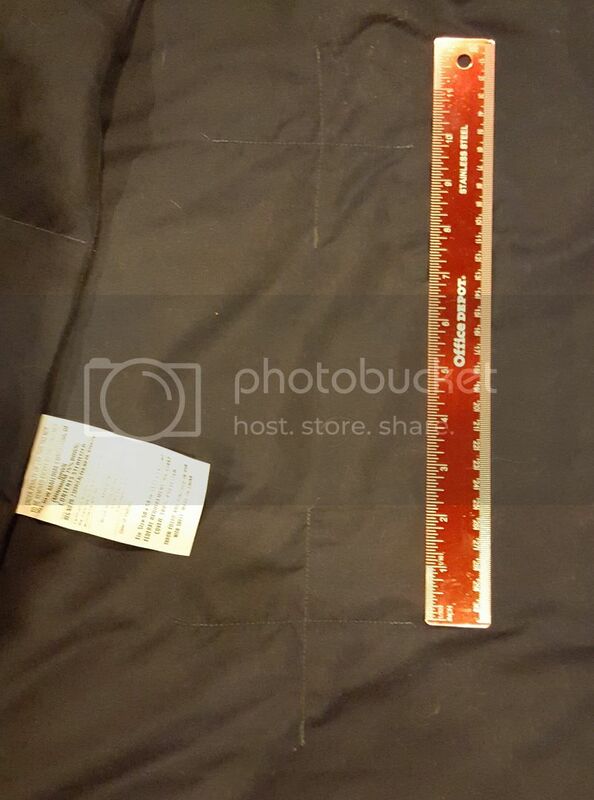 58" long, only 50" wide. $25 each. I paid a total of $58.31 including shipping and tax for two (Texas tax). Edit: note that it is listed as 550 not 700 fill power so many more feathers and less down, this can be irritating since they tend to poke thru and also does not seem as warm for size and more bulky (less compactable, i.e what you get with a 900 fill power jacket is basically something that can be compressed very small for a higher price for example not necessarily a warmer jacket.) Also smaller size, (LxW) as I mentioned. Reviews said it was thin, as is to be expected for relatively low price, I wondered if a little thicker than model originally sold at Costco last September. Also note higher price for smaller blanket so probably best to wait for them to arrive at Costco. Not very ethical, but you could pay $55 membership buy some and then cancel membership if place is long drive or whatever from you. Slightly longer drive for me but prices a little better than Sam's Club it seems, just bummed they don't have early morning hours for business members so I can avoid the masses of common folks like at Sams, ha ha ha... joking, standing in long lines is OK, feels like military. Last edited by TXyakr on Thu Feb 11, 2016 4:58 am, edited 2 times in total. That's not a bad size for a torso length quilt---or as a booster in a full length. Was at the local Costco yesterday in Lake Elsonore, Ca. Not in yet. Anyone seen them at their local stores? Basically there are 4" sewn through crosses about every 9.75" at centers creating 9.75" squares or quilts of Down Insulation with these "cold spots" where it is sewn through. So my idea is to offset the two quilts 50" x 58" (actually longer, wider than I need) so a pad of insulation from one quilt is over the cold spot of the other quilt. Shake as much of the down and feathers away from each of the four edges and roll them over and sew a hem with a tube for shock cord and BAM! you have a Under Quilt! Well just add some grosgrain tabs and shock-cord with tiny carabiners and cord locks, blah blah, I won't bore you with details its all on over a dozen YouTube videos out there... I just don't make YouTube videos, too many idiot comments to deal with, I lack the patience for stupidity. This is common sense. I have a true Singer 1954 model 201-2 sewing machine, cost me $50 including cabinet (yes it injects threads but its a freaking sewing machine deal with it men!) and recently purchased a Canadian made White brand Dressmaster friction drive (no belt like S-201) for $35. I like these old cast iron all metal gear machines, fun projects. I have no intention of making a Dress with either but if one of my daughters wants to then great for her. 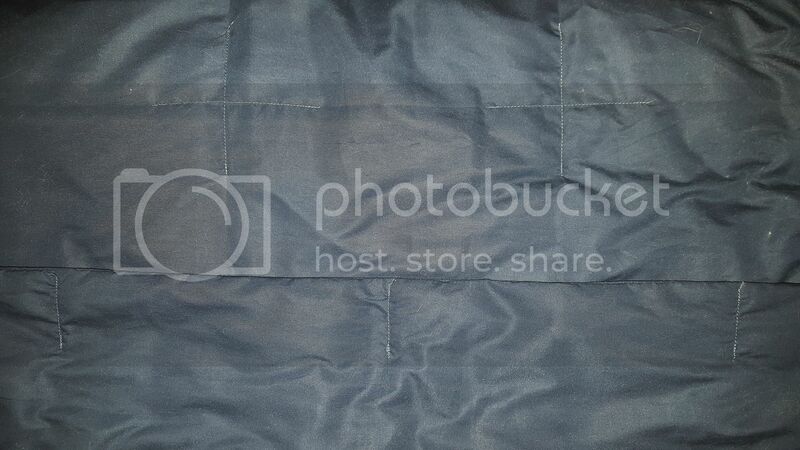 Below photo of just one of 2 quilts rolled up held by large rubber band from office supply store, (note do not store like this or rubber band may rot and cause problems, better to use velcro cable wrap strips or just some cord). Sorry that this is off topic but if you find one of these Singer 201-2 with gear driven motors (no belt) that still works, not all rusted out and missing important parts and can buy it for less than $100 just buy it, clean it up and re-lubricate by instructions online. (replace electrical cords etc.) If decent I will buy "as is" for $50 perhaps more if in good condition, will drive to Austin area for one from DFW or to most places in Oklahoma. But seriously if all you need is a straight stitch for most hammock and other outdoor camping type gear and to sew thick webbing straps and perhaps some leather this is a great machine! Easy to find them on eBay for $200 to 400 or more, and on Craigslist they go fast for cash to whoever can drive out there and sweet talk the owner into selling them their great grandmother's beloved old machine. So get yourself some Costco quilts or similar and start being creative. How thick is the blanket---how much loft? The Double Black Diamond Down Throw is what led me to this forum. There are a couple of them listed on eBay, but there weren't many details about them in the description. The opening bid price was around $46. I googled the description and found them on Amazon from $38 to $58. A bit of further investigation turned up the Costco connection and Sarge's videos. My interest in them was for supplemental insulation in a top quilt, but making an underquilt from one seemed doable. We don't have Costco around here, so I was unaware of these throws until I stumbled on to them on eBay. Blue Ridge Home Fashion showed them as unavailable, but there are still some floating around, just not for $20. Costco has the Double Black Diamond throws back in stock. $20 at Houston area Costco (Willowbrook), not sure about Katy area or others.